Friday marked the ribbon-cutting ceremony for the long-awaited Grand Hyatt Baha Mar Resort, which at $4.2 billion is the most expensive project in Bahamas’ history. The oft-delayed 1,800 room property is located just west of Nassau and promises to be a Caribbean Las Vegas, thanks to its huge casino, its glitz factor (retailers will include Rolex, Bulgari and Tiffany) and its giant scale — the Grand Hyatt alone consists of two 20-story towers and five separate pool areas, and it adjoins a 200,000-square-foot convention facility. With over 40 restaurants and bars planned, Baha Mar has opened five of its food and beverage outlets, including an Asian noodle bar called Stix, a gastropub called the Swimming Pig and a three-meal Italian-themed eatery called 3 Tides. Also opened on Friday, the Jack Nicklaus-designed Royal Blue golf course, the 30,000 foot Espa spa, the convention center and the casino. Baha Mar officials are hoping the soft-opening ceremonies mark an end to more than two years of delays for the project, which broke ground on Nassau’s Cable Beach area in February 2011. Once fully opened next year, the resort will also include a 300-room SLS Lux hotel near its eastern end and a 200-room Rosewood property closer to its western end (the exteriors of both properties are largely completed). Guests will be greeted at the resort’s entrance by a water fountain and lake in which a choreographed water show each hour features lights, music and artificial geysers shot more than 100 feet into the air. Upon entering the hotel to the visitor is welcomed by a $250,000 crystal chandelier centerpiece. Upstairs, though, the Grand Hyatt is taking a slightly more subdued approach. Rooms feature a tasteful violet, blue and white color scheme, while the marble-clad bathrooms are bordered by pocket doors that open to ocean views from the oversized tub. The water-facing rooms are set up so that the beds face the ocean. Rooms have Bluetooth-enabled alarm clocks and Keurig coffee makers. Baha Mar will have its own dedicated area at Nassau’s Lynden Pindling International Airport, where resort guests can check in before being shuttled in private vehicles for the 10-minute drive to Baha Mar. 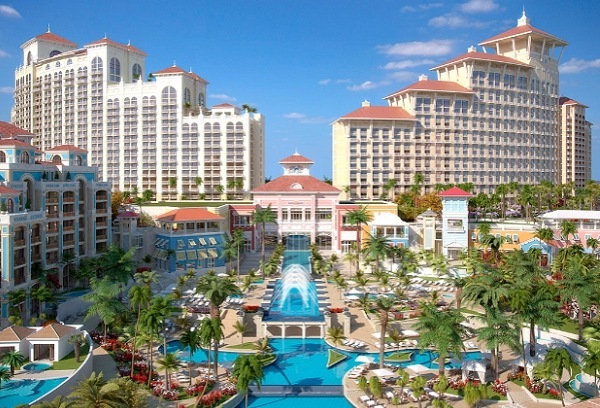 The Grand Hyatt Baha Mar began taking reservations on Friday for stays starting May 29. The hotel’s website displayed rates starting at $370 per night for 470-square-foot rooms, $409 a night with breakfast included.